Today's breathless China headline: "Chinese Yuan's Drop Is Largest Since Its 2005 Currency Revaluation." Yesterday's headline was even more breathless: "China Currency Plunges Most In Over 5 Years, Biggest Weekly Loss Ever." Reading these headlines, you'd be tempted to think that China was in trouble, but you'd be very wrong. 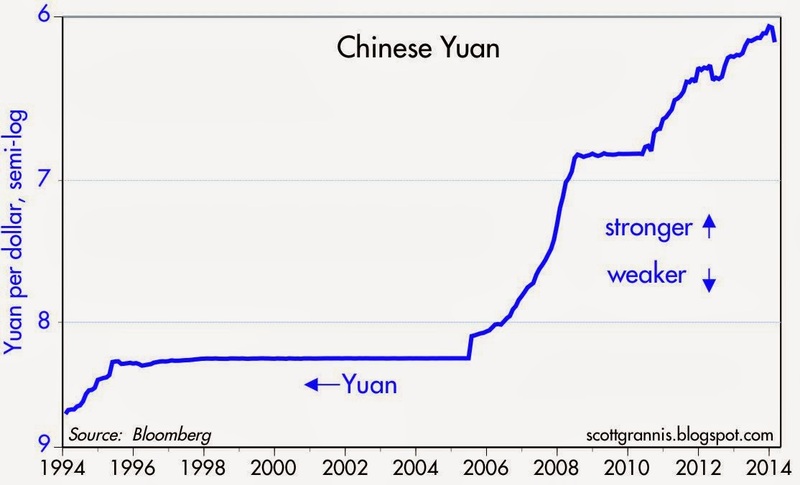 That's right, you can barely see the "plunge" when you look at a long-term history of the yuan. Since its all-time high of 6.04 in mid-January, it has dropped a mere 1.7%, to 6.1415. The big story in China continues to be the yuan's impressive strength, not its weakness: it's up 42% vis a vis the dollar in the past 20 years. And it's not just the yuan appreciating against the dollar. It has appreciated against every currency in the world, and in inflation-adjusted terms as well. 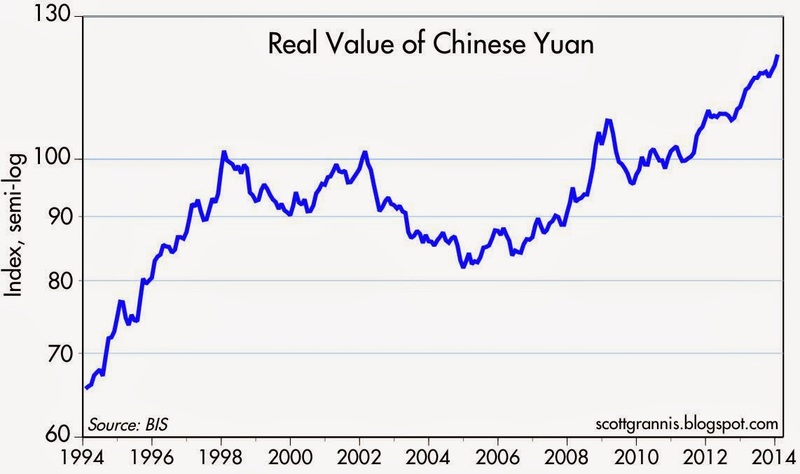 As the chart above shows, the real value of the yuan against a large basket of currencies has appreciated by a staggering 85% in the past 20 years. Only the yen has a better record of long-term appreciation: it rose 250% against the dollar from 1970 through 1994 (from 350 yen per dollar to 100). Spectacular gains in Chinese productivity—which have boosted the size of China's economy by 8-10% per year for the past 20 years—are the main reason the yuan has appreciated. Capital has poured into China, eager to finance and profit from China's impressive progress. To accommodate the huge increase in the size of China's economy, the Chinese central bank had to expand the Chinese money supply by orders of magnitude. They did this in a very prudent fashion, by buying almost $4 trillion of the capital inflows that China has received over the years. These purchases provided a solid foundation (in the form of an expansion of China's foreign reserves—see chart above) for a necessary expansion of the amount yuan in circulation. (Think of the growth of China's foreign exchange reserves as a proxy for net capital inflows.) Yet even though it bought trillions of dollars with newly-created yuan, the central bank allowed the yuan to appreciate. In a sense, they didn't buy enough dollars and euros, and that created an effective shortage of yuan which could only be resolved via a yuan appreciation. But as the chart above also shows, China's accumulation of reserves has slowed down significantly over the past few years. That's because the central bank has liberalized capital flows, and the strong appreciation of the yuan has brought China's costs more into line with costs overseas, with the result that the economy has cooled off. With capital inflows "tapering" off, there is much less pressure for the yuan to appreciate. The central bank is correct in allowing (and even encouraging) the yuan to trade more freely. The yuan was on a one-way street (appreciating) for the past 8-9 years, and that can't go on forever. Looking ahead, it's likely that the yuan will bounce around in a relatively stable channel, rather than constantly appreciating. This new perception alone could help reduce capital inflows and avoid any unnecessary or unwarranted "overheating" of the economy. 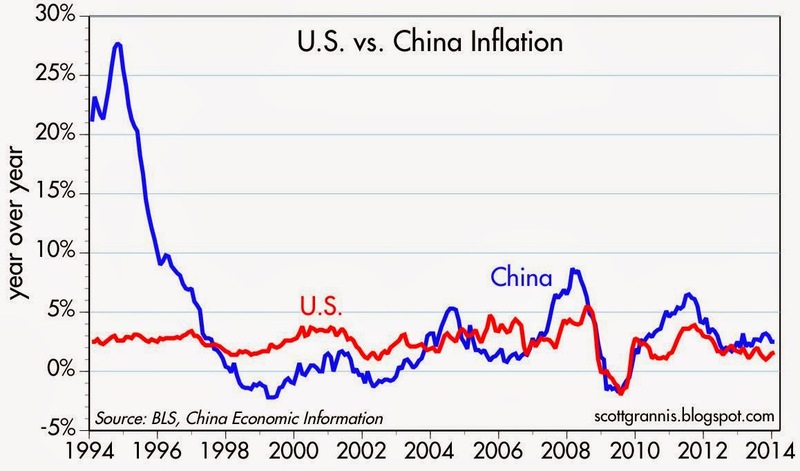 For the past 15 years or so, Chinese inflation has been very similar to U.S. inflation, as the chart above shows. But since the yuan appreciated against the dollar by about 37% over this same period, Chinese prices effectively rose by roughly that amount relative to U.S. prices. 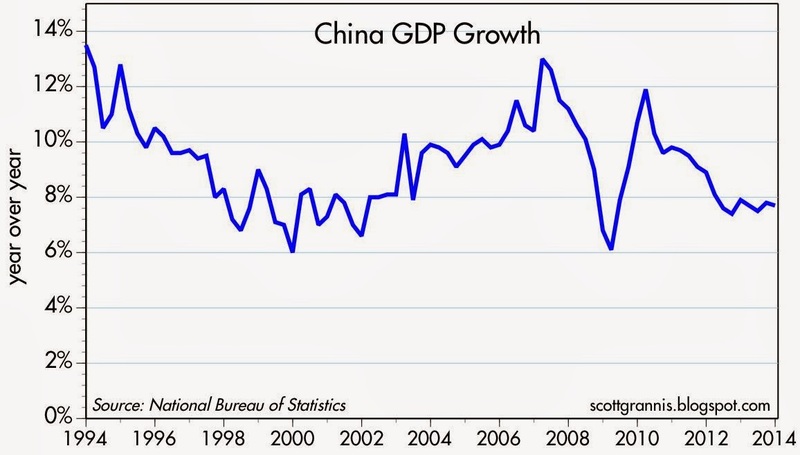 This has made China somewhat less competitive, and that has worked to slow its growth on the margin. But it's still growing by at least 7% a year. 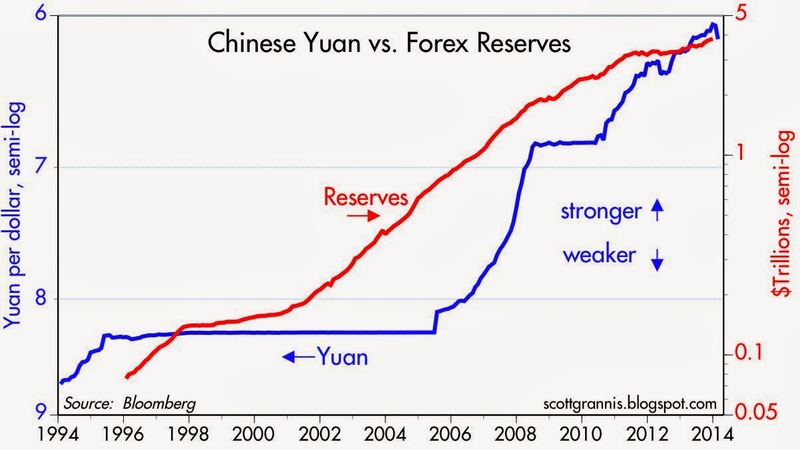 And the central bank still has almost $4 trillion of reserves, which makes the yuan potentially the most rock-solid currency on the planet. What's not to like about a growing economy and a strong currency and low inflation? January capital goods orders beat expectations (+1.7% vs. -0.2%), but they've been relatively flat for the past year. 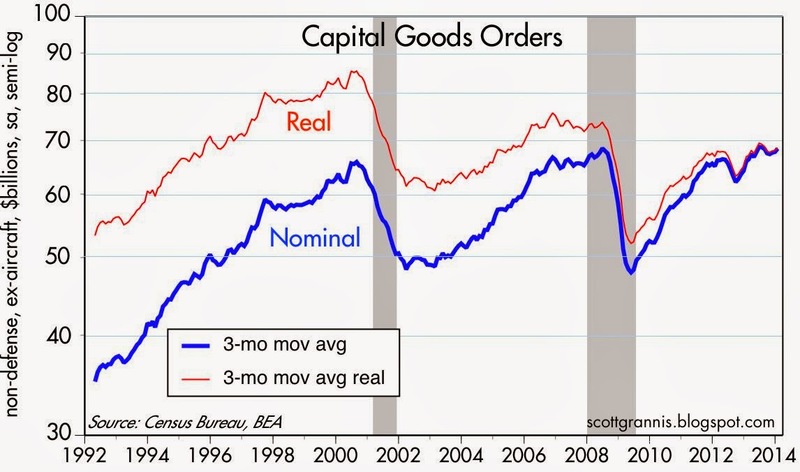 Plus, as the chart above shows, orders in real terms are still some 20% below their 2000 peak, and nominal orders are only marginally higher than they were 14 years ago. We're talking sluggish business investment for more than a decade, and that's one good reason why economic growth has been sluggish in the current recovery. Capex is the seed corn of future productivity growth, so without some meaningful gains in this key variable we are unlikely to see economic growth exceed 2-3% per year. The lack of stronger business investment in capital goods is notable given the very strong growth of corporate profits, as the chart above suggests. 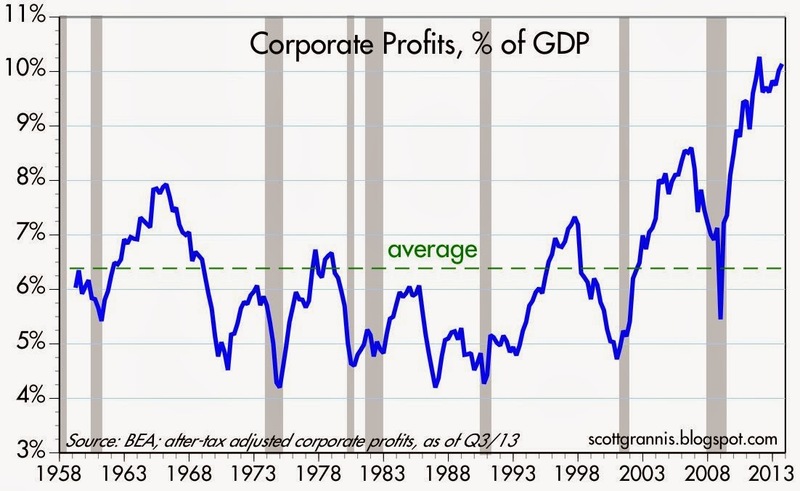 Corporate profits after tax are now at all-time highs, both nominally and relative to GDP, having more than tripled since 2000, from $520 billion to $1.7 trillion. How to explain this? One explanation is simply that the meager gains in business investment are a reflection of an enduring lack of confidence, something that has been a major feature of the current recovery. Households, banks, and businesses have all been quite risk averse since the calamitous 2008-2009 recession. Another explanation is that U.S. corporations have faced the highest tax rate on profits of any developed country, which helps explain why businesses are keeping more and more profits overseas and have declined to repatriate as much as $2 trillion in foreign profits. A mere 70 U.S. companies are holding $1.2 trillion in profits overseas, according to a recent Bloomberg analysis. The key to unlocking the growth potential of this mountain of corporate profits is adopting more business-friendly policies (e.g., cutting regulatory burdens) and cutting corporate income tax rates to a level that makes corporations indifferent to keeping profits overseas or repatriating them. How much longer can Congress ignore the growth-stifling distortions of our tax code and the deadweight loss of our regulatory burdens? According to S&P/Case-Shiller, U.S. home prices in the fourth quarter of 2013 were up 22% in nominal terms from their post-recession low, but still down almost 20% from their 2006 highs. It's likely that home price appreciation has stalled or slowed significantly in recent months, but this does not alter the bigger picture, which is one of a gradual but sustained recovery from a horrific downturn. The chart above covers home prices in 20 major metropolitan markets beginning in 2000. In real terms, home prices as of last quarter (the December 2013 figure released today is a composite of prices in October, November, and December) were still down 30% from their early 2006 highs. 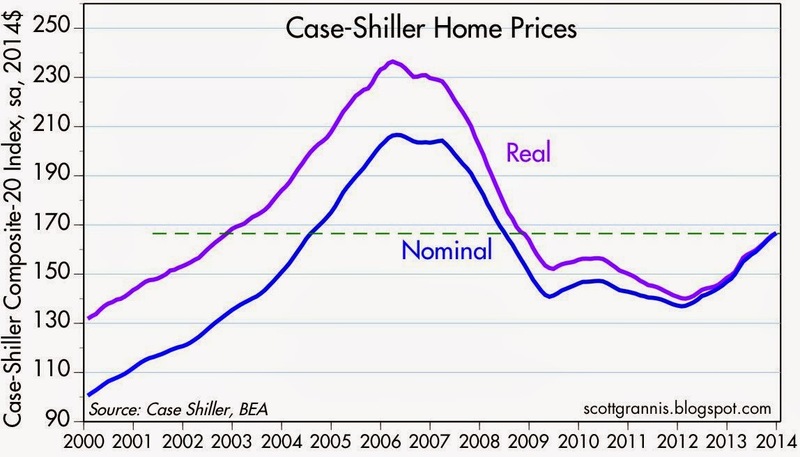 In my view, it's premature to suggest that another housing bubble exists or is in the process of forming. 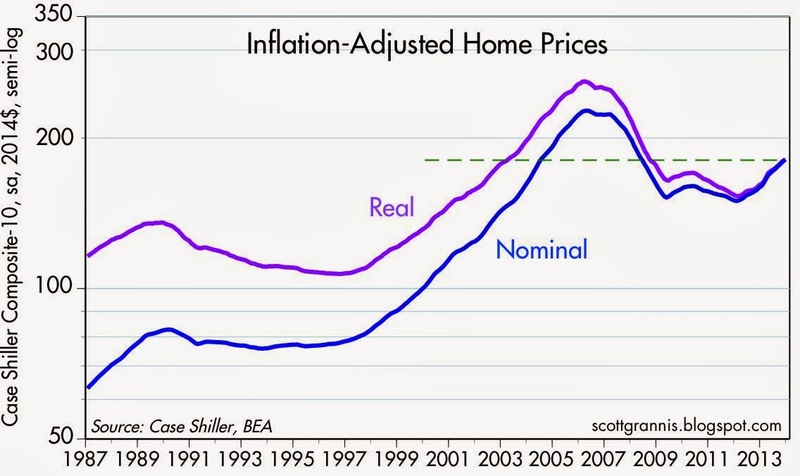 As the chart shows, real prices today are about the same as they were in late 2002. The recent price upturn is pretty much what you would expect to see several years after a harrowing collapse. The above chart covers prices in only 10 major markets, but extends back to 1987. Here we see that in real terms, prices today are about 35% above their 1990 highs—an annualized gain of only 1.3%. Given that mortgage rates are still considerably lower today than at anytime in the past (the past two years excluded), and real disposable personal income has risen at an annualized 2.7% since 1990, housing today is far more affordable than it was in 1990 (when typical 30-yr fixed rate mortgage rates were 10% or so). If the economy continues to recover, there is no reason to think that the current level of housing prices is vulnerable to a decline, even if interest rates rise by several hundred basis points in the next few years. Remember: higher interest rates are the natural by-product of a stronger economy; if rates go up in the next few years it will likely be because the economy is strengthening, real incomes are rising, the population is growing, and the demand for home ownership is rising. Higher interest rates only threaten the economy when they are forced higher by contractionary monetary policy. We are still many years away from such as situation. UPDATE: The stocks of major home builders are doing quite well, having risen 245% from their March 2009 low, as the chart below shows. 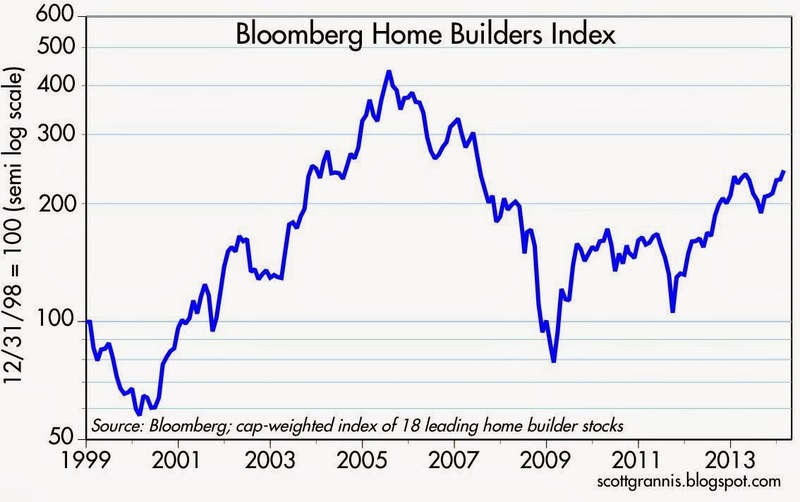 XHB, an ETF based on an equal-weighted index of homebuilders stocks, is now at a new post-recession high, having risen 314% from its March 2009 low (the Bloomberg index of home builders' stocks shown in the chart is a cap-weighted index). Bad weather and seasonal adjustment issues could be obscuring the true underlying progress of the housing industry, but these indices are driven by investors' bottom up analysis of actual sales and earnings and thus should not be ignored—they say the housing recovery continues. A review of key market-based indicators shows that systemic risk is quite low, liquidity is abundant, and the economic outlook is reasonably healthy. This should inspire investors to take on more risk, and it makes a compelling case for the tapering and eventual reversal of the Fed's QE bond purchases. Bloomberg has put together a comprehensive, real-time index of market-based indicators that measures liquidity, credit risk, default risk, systemic risk, and implied volatility (see chart above). Today, the index is very close to its all-time high—things just don't get much better. Note that the index deteriorated in advance of the last two recessions. Its current strength thus implies that the economy is virtually certain to continue to expand. The charts that follow focus on a few of the indicators captured in the Bloomberg index shown above. Swap spreads in the U.S. are about as low as they have ever been. Conditions in the Eurozone are not quite as healthy, but they have improved significantly in the past two years. 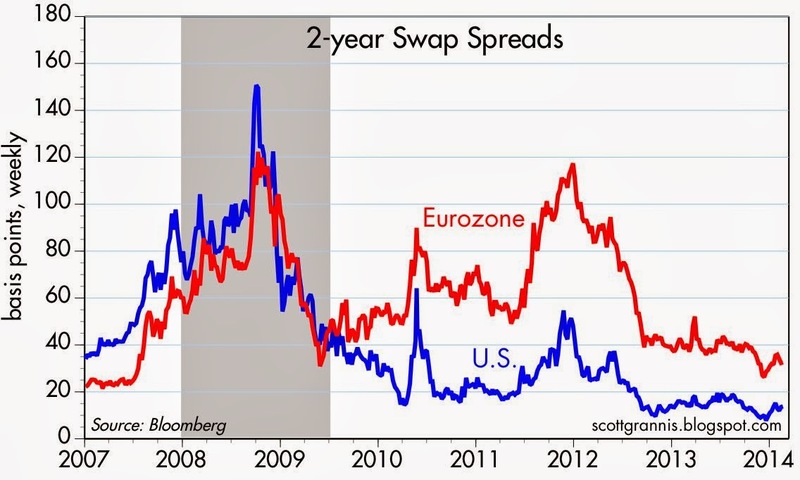 Eurozone 2-yr swap spreads are not too far above the 20-30 bps range that would be considered "normal" or "healthy." The first of the above two charts shows 5-yr credit default swap spreads for investment grade and high-yield (junk) bonds. The second shows the difference between the two, which isolates the extra spread demanded by investors to accept the additional risk of junk bonds. 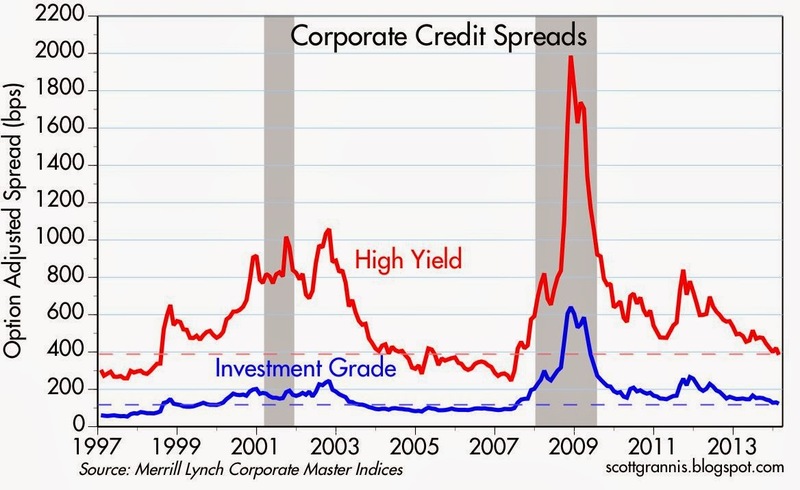 Both show that credit spreads are at or near their lowest levels of the current business cycle expansion, and only marginally higher than they were one year before that Great Recession hit. This chart shows a longer-term view of the spreads on corporate bonds. 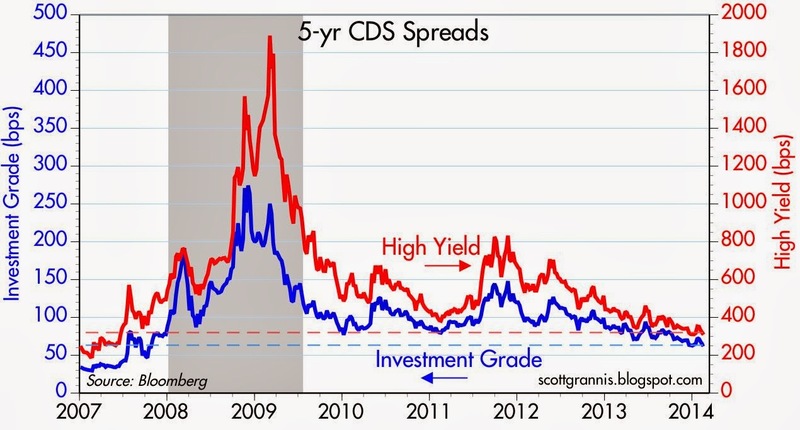 It's the same message as CDS spreads: credit/default risk today is perceived by the market to be only marginally higher than it was during prior periods of healthy economic growth. 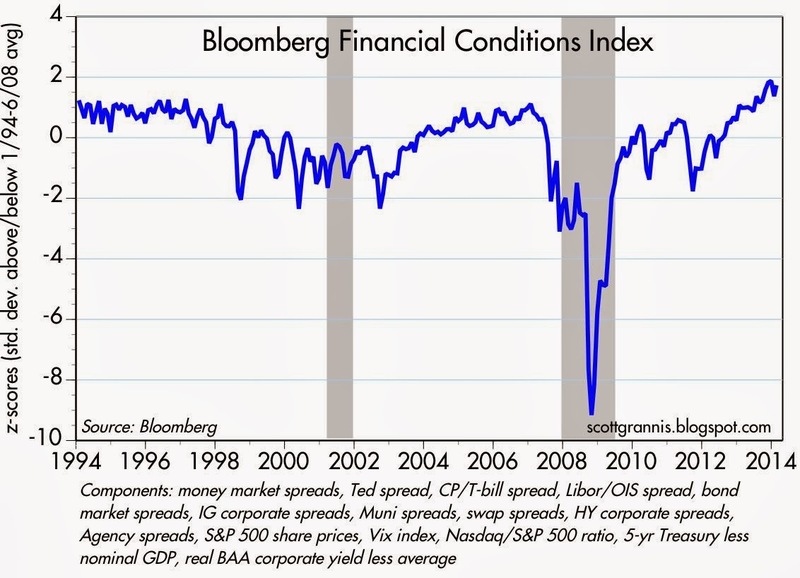 Importantly, spreads continue to decline on the margin, suggesting improving economic conditions lie ahead. 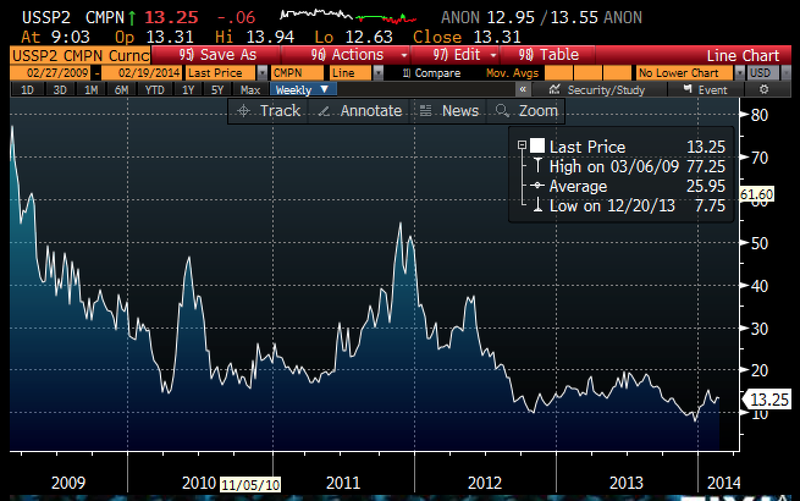 The Vix index of implied volatility is currently trading in a "normal" range. There are no significant sources of concerns in today's market: the Eurozone is doing better, China is still growing, the federal budget deficit has shrunk dramatically, the Fed has tapered and the sky has not fallen, and corporate profits remain very strong. A contrarian might worry that this reflects complacency and that itself is a concern. It's always possible that some new fear-inducing event will pop up around the corner, but in the absence of major sources of risk it is likely that the prices of risk assets will continue to move higher. Especially since the return on safe-haven cash and cash equivalents is very close to zero. Ed Yardeni had a post a month ago (Challenges Facing Emerging Markets) that got me thinking about the relationship between emerging markets, commodity prices, and the dollar. He expanded on this theme in another post today (Emerging Markets Are Cheap for a Reason). He thinks emerging markets are likely to underperform because commodity prices are likely to be flat, and commodity prices are likely to be flat because global growth is likely to remain subdued. I don't disagree with him, but I offer the following charts in an effort to show that the value of the dollar is also an important variable to consider. If, as I suspect, the dollar is more likely to strengthen than weaken in coming years, this would add to the case against investing in emerging markets. By the same logic, if you think the dollar is more likely to weaken, then emerging markets look attractive at current levels. 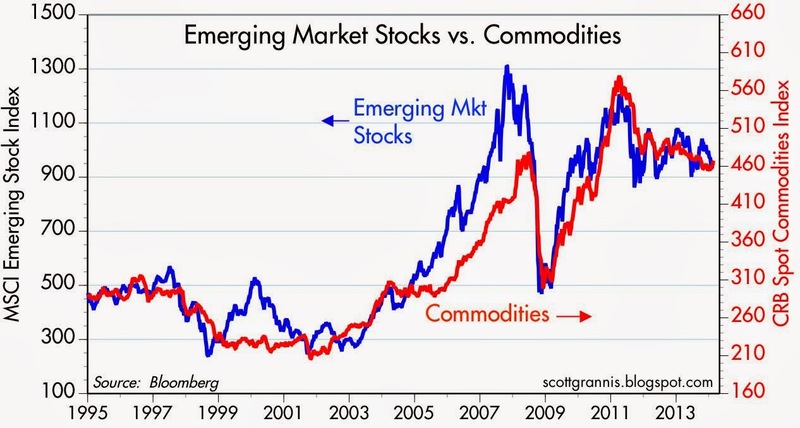 As the chart above shows, there has been a very strong correlation between the value of emerging market stocks and commodity prices in the past few decades (note that the CRB spot index excludes petroleum). This is a commonsense relationship, since emerging market economies tend to be very resource-driven (e.g., strongly reliant on agricultural and raw materials exports). What's good for commodities is also good for emerging market economies. 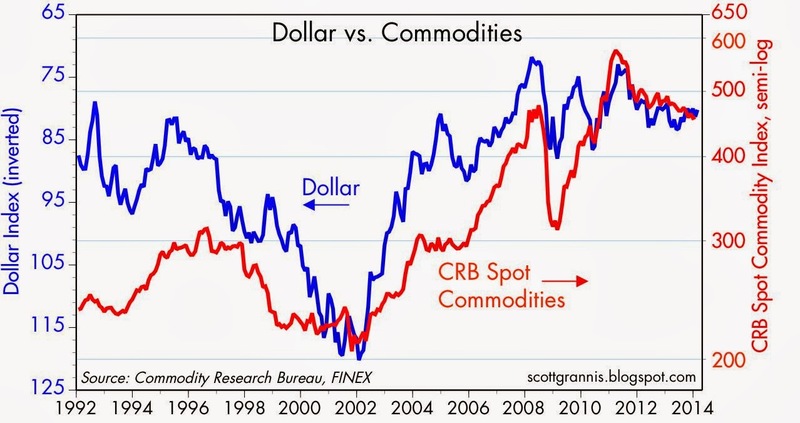 As the chart above shows, there has been a fairly strong inverse correlation between the value of the dollar and commodity prices over the past few decades. Since 2002, the dollar has lost about one-third of its value against other major currencies, and commodity prices have more than doubled. 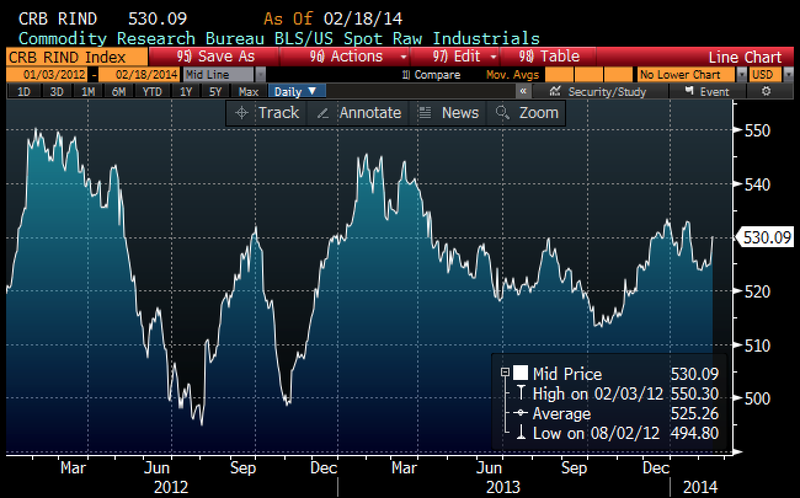 Both the dollar and commodity prices have been relatively flat for the past two years. 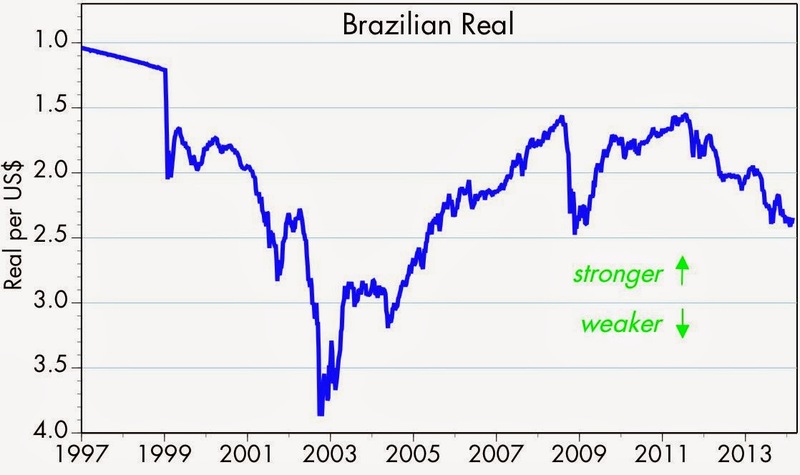 In the past two decades, the Brazilian stock market has experienced extreme volatility—much more than most other emerging markets—due mainly to the huge gyrations of Brazil's currency. The real lost almost three quarters of its value against the dollar in the early 2000s, then more than doubled from 2003 through 2008. In the past 2-3 years it has lost almost one third of its value. 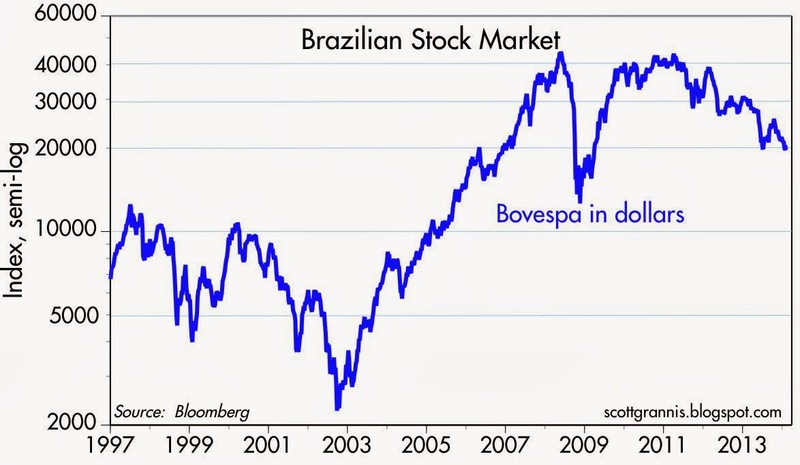 That's another way of saying that the value of the dollar has been a critical variable in determining the value of Brazilian equities. A stronger dollar would thus make it very difficult for the Brazilian economy to advance. 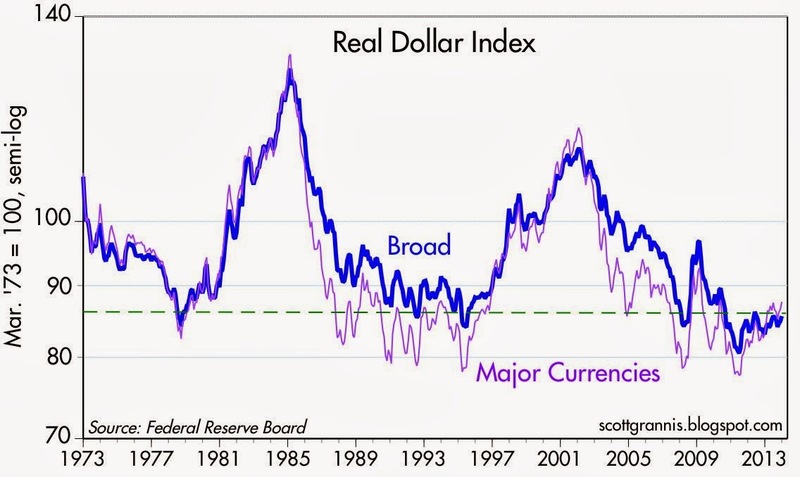 The chart above shows the inflation-adjusted value of the dollar against a large basket of currencies and against a basket of major currencies. Although the dollar has generally appreciated in the past three years, it is still quite weak by historical standards. A significant weakening of the dollar from current levels would take it into uncharted territory, whereas a continued moderate appreciation of the dollar, such as we have seen in recent years, would take it back to more normal levels. For several years I've held the view that the dollar was likely to appreciate, mainly because the U.S. economy was likely to outperform relatively dismal expectations, and I still think that's the case. Gold prices have tended to track commodity prices reasonably well over the years, as the above chart suggests, although gold has been significantly more volatile. 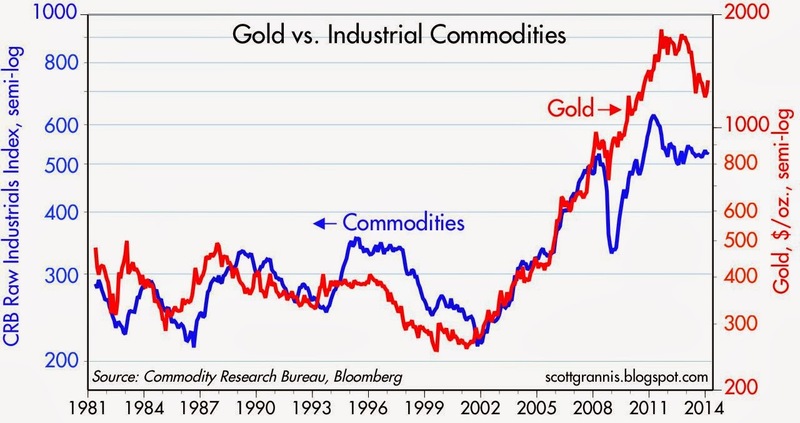 The way I read this chart is that gold prices "overshot" commodity prices following the Great Recession, and are now in the process of coming back down to a more normal relationship—suggesting a gold price of $900 or so in the next few years. Like commodities, gold prices tend to move inversely to the value of the dollar, so a substantial decline in gold prices from currently levels could well coincide with a stronger dollar. The growth of C&I Loans (a proxy for bank lending to small and medium-sized businesses) has accelerated since late November, and C&I Loans outstanding are now at a new all-time high of $1.64 trillion. Over the past 3 months, this measure of bank lending has grown at a 16.4% annualized pace, the fastest since Q3/12, when Eurozone sovereign default risk was declining from record levels. Lending is up at a 10% pace over the past six months, and 8.7% over the past year. Total loans and leases at all commercial banks have jumped by $88 billion in the past 8 weeks, and now stand at $7.46 trillion—not yet a record high, but closing in on the $7.74 trillion high set in October 2008. Banks are evidently relaxing their lending standards, and/or businesses and consumers are more willing to borrow. All of this reflects increased confidence, and that bodes well for future economic growth. The brutal winter suffered by most of the country (with the great exception of the West Coast, particularly California) has been a drag on the economy. 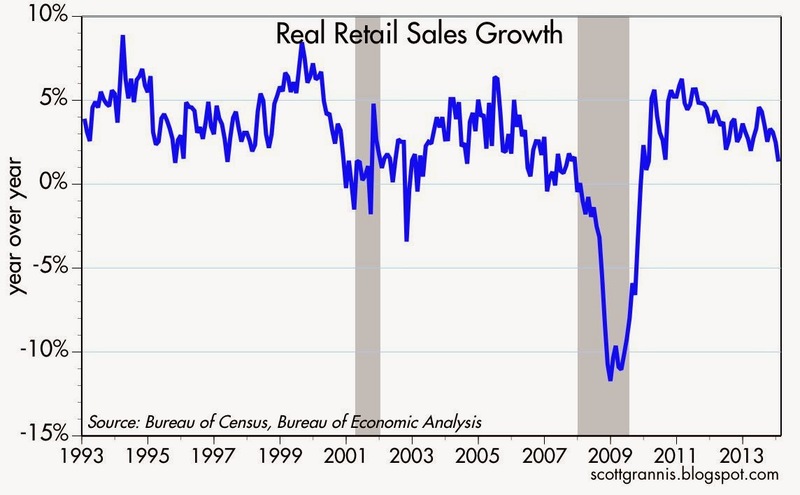 We see it in disappointing retail sales, housing starts, and builder sentiment. But that doesn't mean the economy is about to roll over and die. It just means that where there was some hope a few months ago that economic growth was picking up steam, we now see that it was only temporary. Until the outlook for policies changes (e.g., tax reform, reduced regulatory burdens) we should expect to see the economy continue to grow at a 2-3% pace. January retail sales were disappointingly slow. 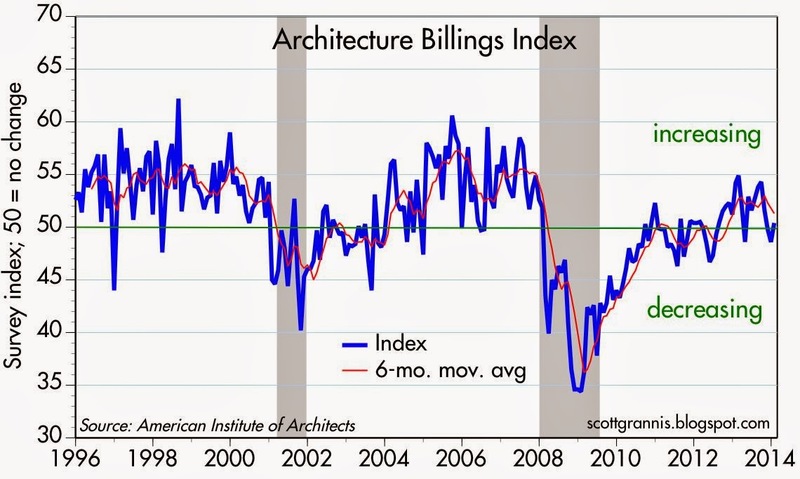 Architecture billings looked quite promising until a few months ago. 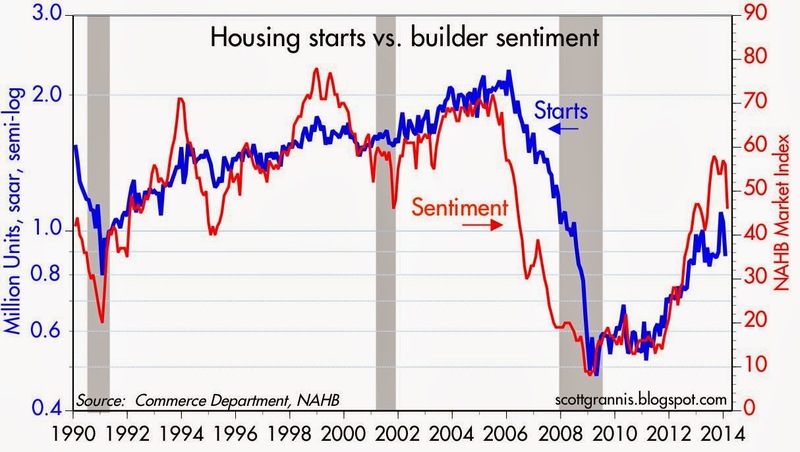 Terrible winter weather had a predictable impact on housing starts and builder sentiment. But despite these signs of a slowdown, commodity prices remain firm. In fact, they haven't budged from their flat trend of the past two years. 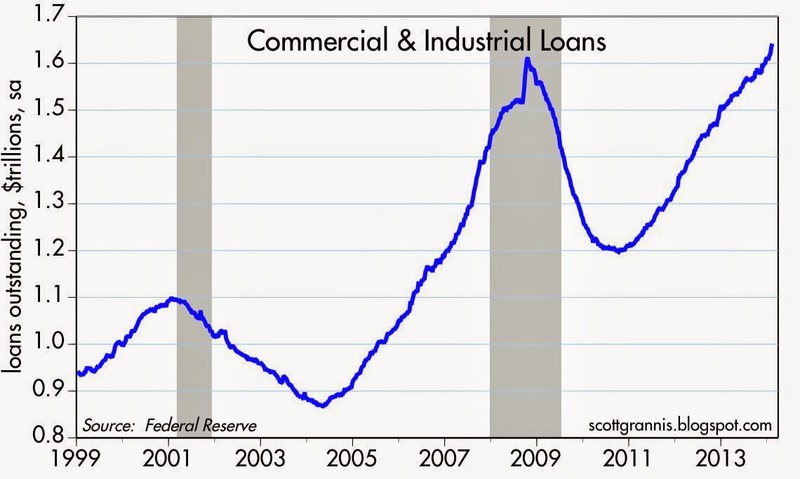 Commercial and Industrial Loans have actually picked up in the past several months, and are now at a new all-time high. Banks are more willing to lend, and businesses are more willing to borrow on the margin, and that means confidence is coming back. A lack of confidence has been one of the major headwinds in this recovery, and the return of confidence is therefore one of the most promising developments. 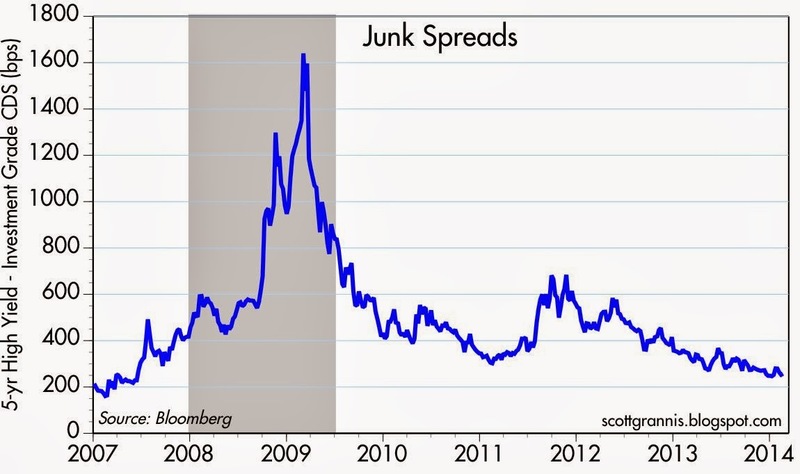 Swap spreads, shown in the chart above, are about as low as they have ever been. This is an absolutely critical variable, and it shows no signs of any fundamental deterioration in the economy or in financial markets. Sooner or later the bad winter weather will pass—and we in California dearly hope the rains will resume—and the economy will likely continue to grow at a modest pace. As I've remarked repeatedly over the years, this recovery has been dominated by risk aversion, and that's one reason it has been the weakest recovery ever. The world suffered a profound shock in 2008, and it's taken a long time for the effects to wear off. One of the clearest signs of risk aversion has been the rather spectacular growth of bank savings deposits, despite the extraordinarily low rate of interest they have paid. Safety, not yield, was of paramount concern for most folks. There are now emerging signs that this is changing, and that is happening because confidence is slowing returning—investors are becoming less risk averse. The return of confidence—should it continue—has profound implications for the price of risk assets and for the future course of monetary policy. On the margin, investors are now more likely to prefer the higher yields available on corporate bonds and equities than they are the safety of bank deposits. The shift into riskier assets could become a stampede unless the Fed raises short-term interest rates by enough to make savings accounts attractive on a risk-adjusted basis with other assets. 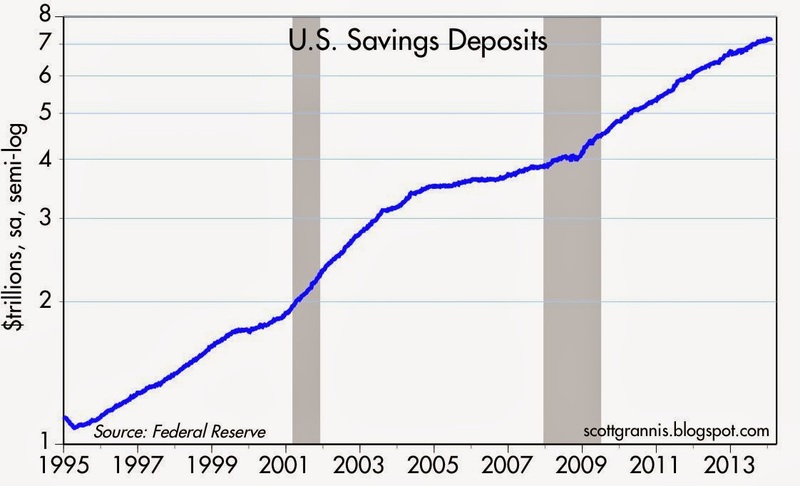 Bank savings deposits started to surge right around the end of 2008, when global financial markets teetered on the verge of collapse. Savings deposits at U.S. banks totaled $4 trillion at the time, and now, just five years later, they stand at $7.1 trillion. That works out to a 12% annualized growth rate. 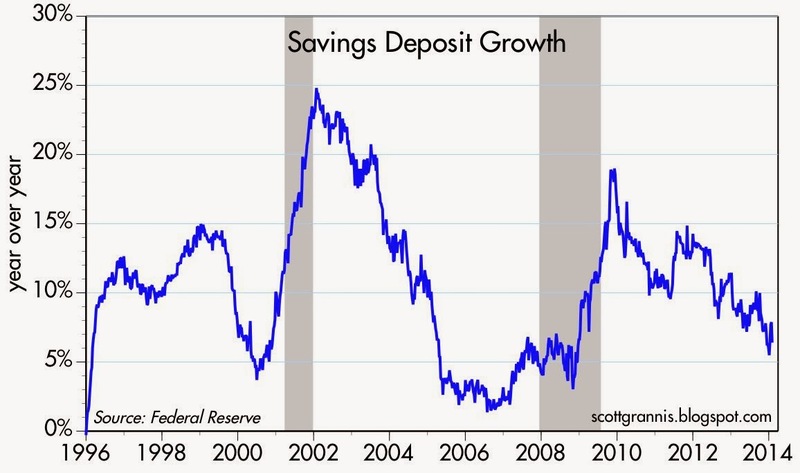 The chart above shows the year over year growth rate of savings deposits. It has now dropped to 6.4%, but savings deposits have only grown at a 3.2% annualized rate over the past six months, and not at all over the past three months. Something is happening here that bears watching, and I think it is the return of confidence. This is very big news. 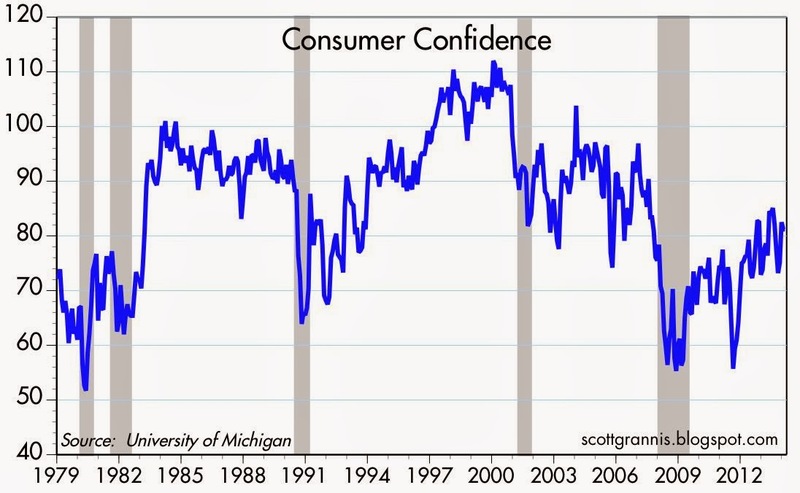 As the chart above shows, consumer confidence has been slowly rising in recent years, but it remains relatively low from a long-term historical perspective. The return of confidence is still in its early stages. The same pattern can be seen in the PE ratio of the S&P 500, if you consider that PE ratios are a proxy for investors' confidence in the outlook for corporate profits. PE ratios have been rising since September 2011, as the market absorbed the shock of the onset of the Eurozone sovereign debt crisis, which peaked in late 2011. 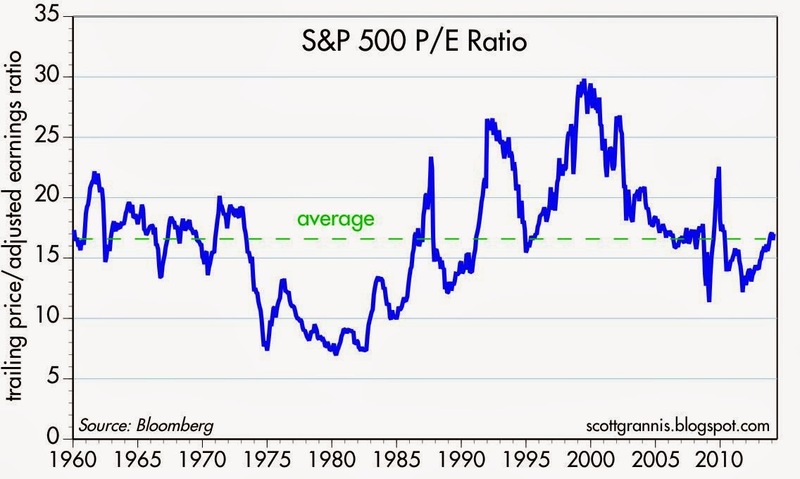 However, PE ratios are still only "average" as the chart shows. There is no sign yet of the wild-eyed optimism that we saw in late 1999 and early 2000. The chart above shows two more ways of looking at confidence: the price of gold and the yield on 5-yr TIPS (shown inverted, so that yields become a proxy for the price of TIPS). At the same time that bank deposits were surging, investors were piling into gold and TIPS, since both offer unique protections: gold is a classic refuge from all kinds of uncertainty, and TIPS are default-free and provide government-guaranteed protection from inflation. Demand for gold and TIPS was very strong up until about a year ago, but both have suffered from a substantial decline in price since. Just as the growth rate of savings deposits has declined over the past year, the price of gold and TIPS has declined as well. The demand for safe assets is down as confidence slowly returns. 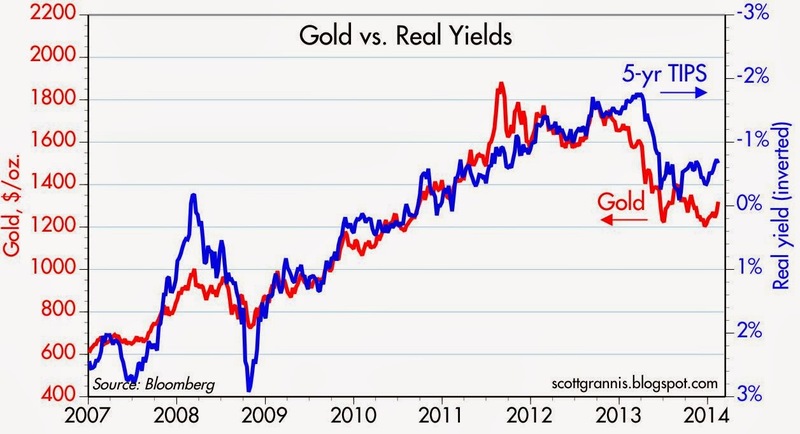 If confidence continues to increase, we should see the prices of gold and TIPS decline further. Arguably, the most under-appreciated statistic today is the unprecedented and ongoing decline in federal government spending. In the 12 months ended January 2014, spending was 4.4% below the level of January 2013. Annual spending has not increased at all since mid-2009. We've lived through over four and a half years of zero net change in spending, and almost three years of steadily declining spending (spending peaked in Q1/11), and the sky has not fallen. Not only is this excellent news, but it is news that has proven to be the exact opposite of what was expected to happen. Spending was supposed to continue to rise for as far as the eye can see, by at least 4-5% per year. The still-prevailing Keynesian wisdom (will it ever be vanquished?) holds that a decline in spending relative to budgeted baselines of such magnitude would prove devastating to economic growth. But our new (new in the sense that classical economic thinking is making a dramatic comeback) understanding of how the economy works tells us that less government spending—especially when it comes from a very high level—is very good for the health of the economy. 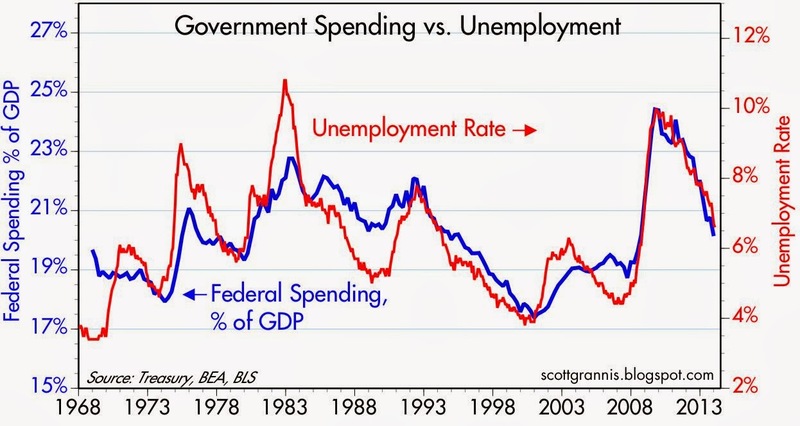 The chart above makes that point: the unemployment rate invariably declines as the level of government spending falls relative to GDP. Regardless of how the money is spent (most of it goes not for infrastructure but rather for transfer payments), the federal government cannot spend money as efficiently or as productively as the private sector. And regardless of how federal spending is financed (by borrowing or taxing), spending always requires taking money from the private sector. 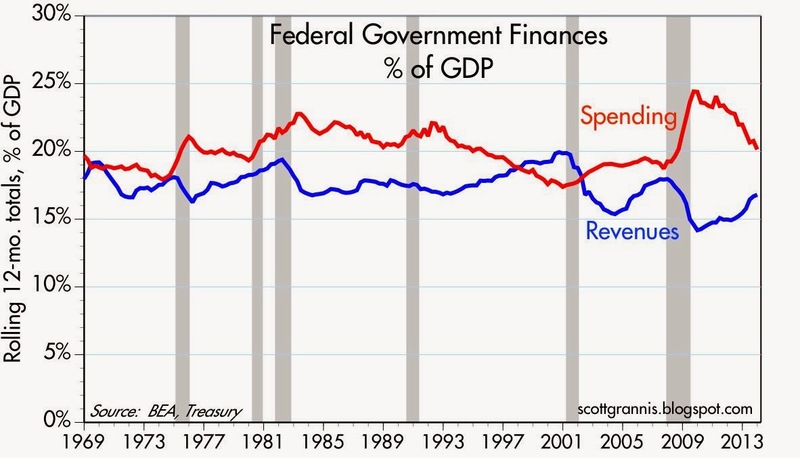 At current levels, the bulk of government spending is still a deadweight loss to the economy. 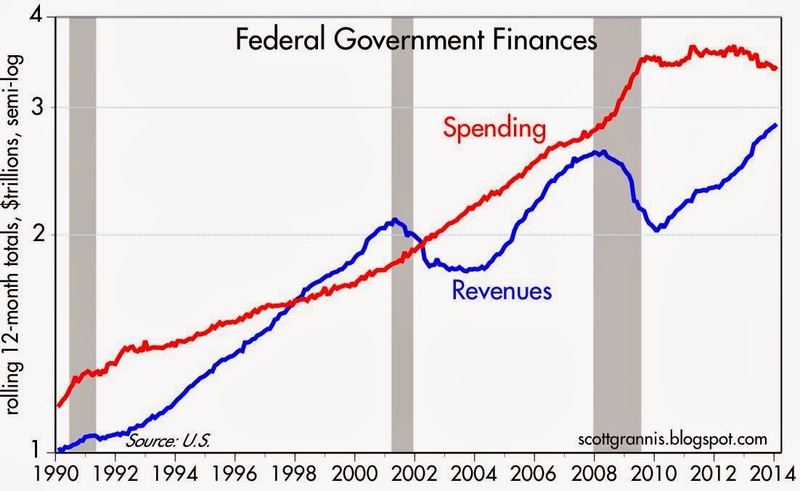 The chart above shows that spending has not increased since mid-2009, whereas revenues have increased a lot. The vast bulk of the increase in revenues has been organic: the result of an expanding tax base (more people working, higher incomes, higher corporate profits), and not the result of higher tax rates. Today Congress decided to suspend the debt ceiling until March 2015. Is that a big deal? No, because we no longer have a budget crisis. 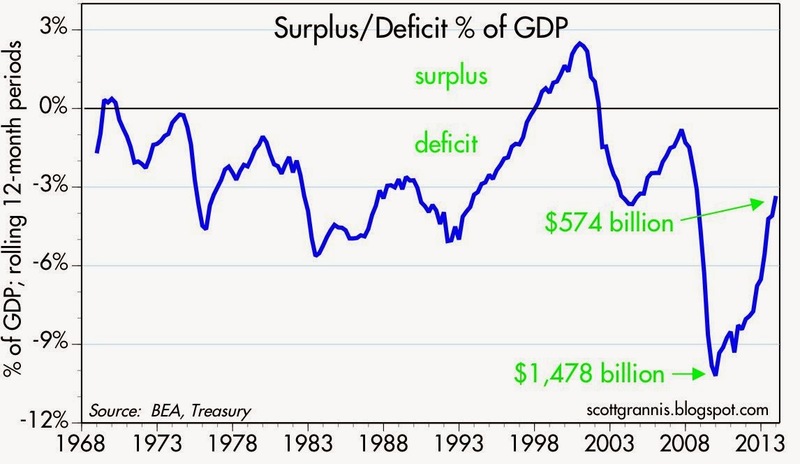 The federal budget deficit has fallen to a mere 3.3% of GDP, and that's not scary at all. If recent trends continue, the budget deficit could be less than $400 billion by the end of this year, and that would probably be only 2.5% of GDP. The challenge going forward, at least for the next year or two, will NOT be to rein in spending in order to keep the deficit and the debt from exploding. It will be to reform our tax code, which has become Byzantine in its complexity and suffocating in its progressivity. We have applied so-called "austerity" to spending, and we have succeeded. Now we need to apply policies that represent genuine stimulus, and that means lower and flatter marginal tax rates with fewer deductions and subsidies. Reduced regulatory burdens would also be a huge help (hint: repeal or redesign Obamacare so that market forces are brought to bear on the problem instead of trying to solve things by government fiat). The biggest problem we face today is that the economy is operating at only 90% of its capacity (see above chart). We need policies that grow the economy, and the best way to do that is to create incentives for the private sector to work harder and invest more. What better way than to slash corporate tax rates and marginal tax rates on incomes (which in many cases are approaching 50-60%)? It's almost a no-brainer, but hardly anyone gives tax reform a chance these days. As I pointed out the other day, the prospects for tax reform have improved greatly with the CBO's new-found respect for the dynamic effects of changes in marginal tax rates. Tax reform that flattens the tax code by eliminating subsidies and deductions and lowers top marginal rates shouldn't be difficult at all to justify, since it could dramatically boost future economic growth. Thanks to a huge decline in the burden of government spending and the CBO's introduction of dynamic scoring, supply-side economics is about to experience a long-overdue comeback. We'll probably have to wait for the November elections to see exactly how powerful and imminent this new dynamic is, but a new and healthier direction for policy should be evident even before then, and markets are excellent at discounting that sort of thing. In the world of public policy, the Congressional Budget Office's recent finding that Obamacare will weaken economic growth and reduce future employment is like an earthquake of magnitude 8. Finally, finally, the CBO has introduced dynamic assumptions into its models of how the economy responds to existing and proposed policies. (Supply siders have been waiting for this moment for decades.) Before, the CBO would assume that a 10% increase in tax rates would translate into a 10% increase in tax revenues. Now and forevermore, we hope, they will calculate how much the higher rate is likely to depress economic activity (e.g., higher marginal tax rates are likely to cause a reduction in the tax base that could offset all or part of the increase in tax rates). The CBO now acknowledges that Obamacare will hurt the economy because it creates incentives for people to work less. The phasing out of Obamacare subsidies will act as a new marginal tax on work, and whenever you raise taxes on some activity, you should expect to see less of it. We've known about the higher marginal tax rates hidden within Obamacare's complexity for a long time. What's new is that they are now officially acknowledged by the CBO. The back story of how this sea change came about can be found in a fascinating WSJ interview of Casey Mulligan, "The Economist Who Exposed Obamacare." Clip this story and file it away so you can show your descendants that you were there when the course of public policy and economic history changed for the better. 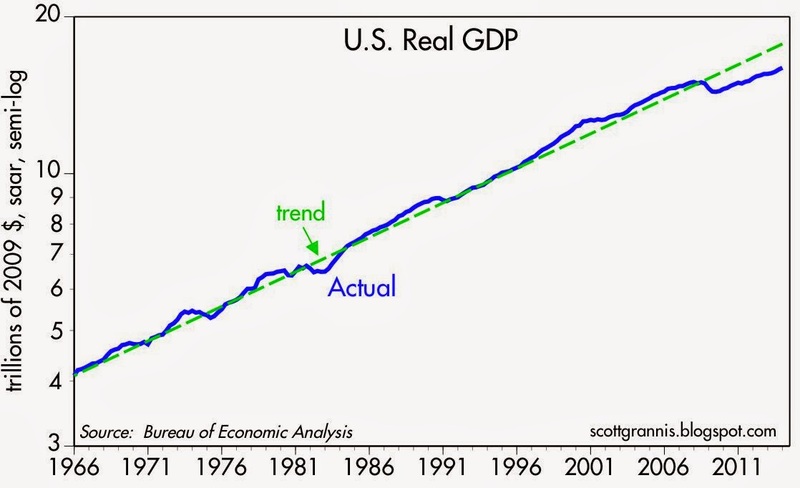 The chart above (from the Mulligan interview) is one answer to the question "Why has this been the weakest recovery ever?" 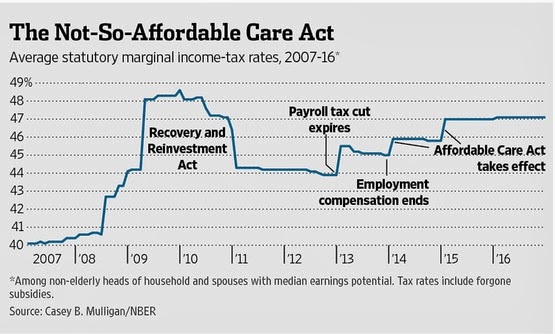 Average marginal income tax rates have increased by 15% since 2008, from 40% to 46%, and will increase to 47% next year thanks to the ARRA's "stimulus" spending (over 75% of which consisted of income redistribution) and Obamacare. This comes on top of the huge increase in regulatory burdens occasioned by Dodd-Frank and Obamacare. The average working-age person in the U.S. now faces the prospect of keeping only 54% of any additional income he or she earns. It's no wonder the economy has lost a lot of its vitality. Some workers today even face the harsh reality of keeping less income despite working and earning more (i.e., they will face marginal tax rates in excess of 100%). My own effective marginal tax rate is over 65%, and that is a powerful force that keeps me from working: I have no desire to hand over two-thirds of any additional income I make to the government. ... the CBO ... reported that by 2024 the equivalent of 2.5 million Americans who were otherwise willing and able to work before ObamaCare will work less or not at all as a result of ObamaCare. Mr. Mulligan's empirical research puts the best estimate of the contraction at 3%. ... "implicit marginal tax rates" in ObamaCare make work less financially valuable for lower-income Americans. Because the insurance subsidies are tied to income and phase out as cash wages rise, some people will have the incentive to remain poorer in order to continue capturing higher benefits. The good news, from a forward-looking perspective, is that CBO's new method of dynamic scoring will make tax cuts easier. Before, CBO assumed that tax cuts were automatic losers no matter what; now they will assume that tax cuts can help pay for themselves by increasing economic activity. The economy is crying out for tax reform—particularly a reduction in the grievously high corporate income tax rate. So with the relatively low level of the federal deficit these days and CBO's new dynamic scoring methodology, we could see some very positive changes (e.g., lower marginal tax rates for businesses) in the future. And that, in turn, could revitalize the outlook for economic growth. The January jobs report was disappointing, but it doesn't alter the big picture: the economy is most likely still growing at a modest 2-3% pace. Both the December '13 and the January '14 jobs reports were weaker than expected, but as the chart above shows, stuff like that happens from time to time. We'll probably see some stronger-than-expected reports in the near future that offset this. 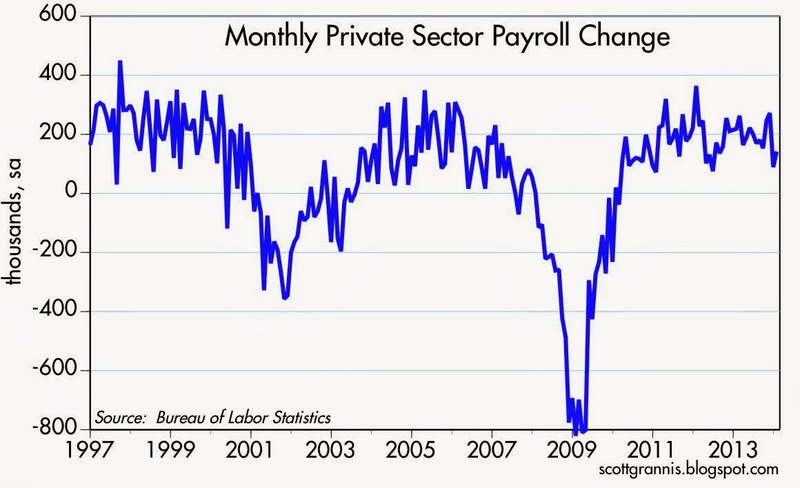 Actually, the household survey in January found a lot more private sector workers than expected (313K vs. 142K). The household survey is much more volatile than the establishment survey, so this doesn't mean a lot. But as the chart above shows, the two surveys do track each other pretty closely over time. Sometimes one zigs while the other zags, the the past few months have been a good example of that. 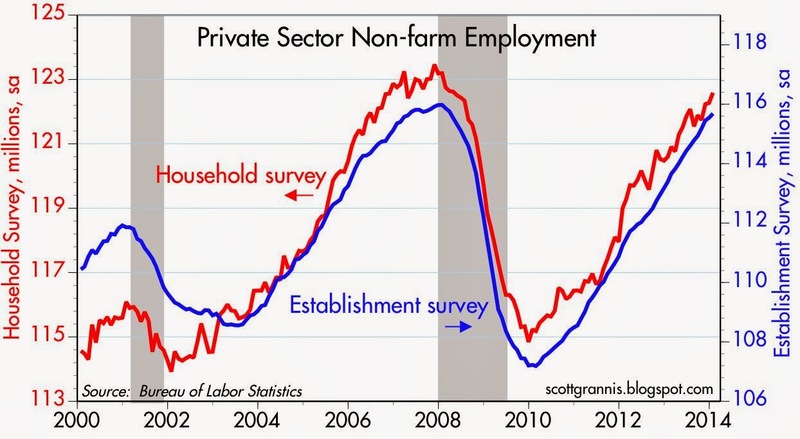 On balance, as the chart above shows, private sector jobs are growing at roughly a 2% annual pace on average, which is not particularly remarkable nor scary. 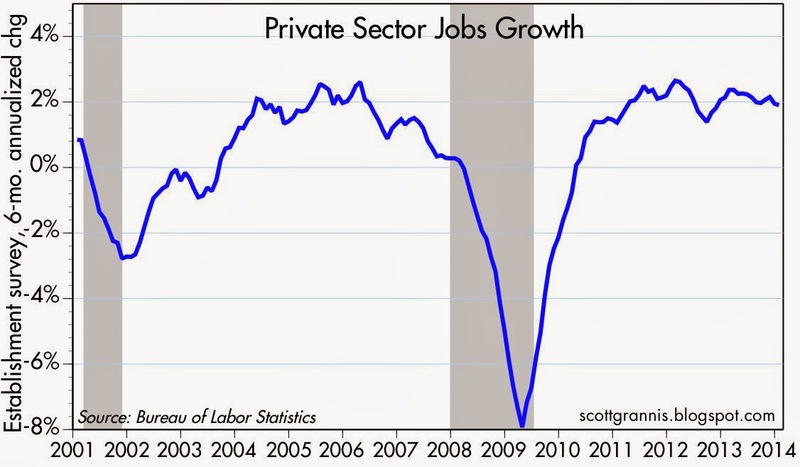 The public sector has borne the brunt of net job losses in this recovery, as the chart above shows. That's bad for those affected, of course, but a good thing for the economy overall, since the productivity of the private sector is much higher than that of the public sector. Government is still huge, but it is shrinking, and that gives the private sector more breathing room. Keynesians view any shrinkage in government or government spending to be a negative, but supply-siders see a decline in the relative size of government—considering its monstrous size—as a positive. Since this report doesn't change the big picture materially, it has few if any implications for the course of monetary policy, which is likely to continue to taper. And since there are no signs of emerging weakness, it is good for risk assets, if for no other reason than that they yield so much more than cash, and cash yields almost nothing. In 2013 the government of the United States spent 55 percent more money — in real, inflation-adjusted terms — than it did in 1999. Economic growth in that 14-year span has been 30 percent. Where government at all levels soaked up 32 percent of national economic output in 1999, it took in 37 percent in 2013 — an increase of nearly a sixth, in less than a decade and a half. By way of comparison, for the first 125 years of this nation’s existence under the Constitution, through 1914, government spending was largely parked between 3 percent and 6 percent of national output. The gorging on the part of government in our recent past has been so unrelenting that aside from flashes from the likes of the Tea Party, the public is meeting the development with quiescence. At $6.4 trillion per year, total government spending is now so immense that any yearning for something smaller and more reasonable from our minders in the state runs the risk of appearing as quaint and otherworldly. Government that is huge and ever-expanding is a matter of concern in its own right. But perhaps less understood is an additional problem: the developments of the current millennium are inuring a rising generation of Americans to the immovable fact of big government. It was only when tax cuts did not come in the face of the huge 1999 and 2000 federal budget surpluses that the Fed began its contemporary activism, an activism which grew to an unimaginable extent in the aftermath of the Great Recession. This is not to mention the unholy tide of regulation and spending, from Dodd-Frank to Obamacare, which has washed upon us since 2008. Given the resurgence of big government in the 21st century, private enterprise in this country has proven reluctant to explore the full extent of its legendary ambition. Instead of conceding long-term mediocrity under Leviathan, we should take inspiration from our past, indeed our recent past. The last time we were stuck with 2 percent growth for the long term, the 1970s and the early 1980s, we mustered a means of narrowing government. The real results were so stellar that to recite them is to take us back to a world we have lost — but only 15 years ago. Tax cuts, stable money, and the rendering of spending and regulation as superfluous are the formula of the supply-side revolution — the Reagan Revolution. They stand sentinel right there, not long ago in our history, as the way to advance through our sluggishness and purposelessness today. All emerging market currencies have been falling since taper-talk first surfaced last Spring. But it's a mistake to say that the prospect of Fed tapering has created a crisis for emerging market countries, and/or that the problems of emerging market economies pose some existential threat to the U.S. The chart above shows the dollar value of eight emerging market currencies, indexed to 100 as of the end of January, 2007. All of these currencies have been declining since last May, when the Fed began floating the idea of tapering its bond purchases. 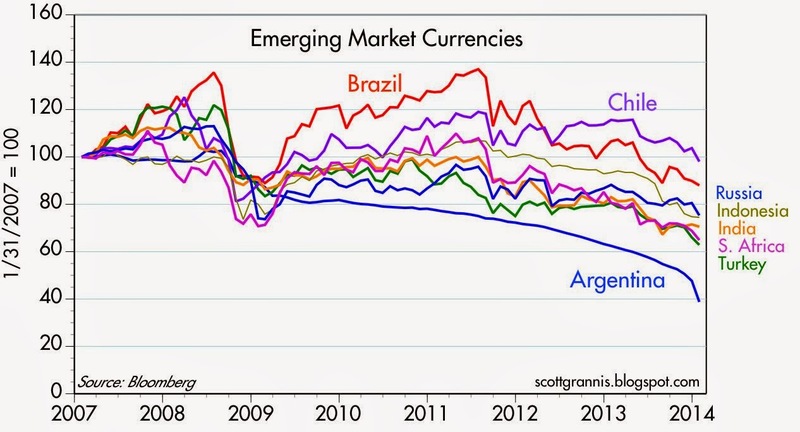 But as the chart shows, all of these currencies have been falling against the dollar since mid-2011. In short, the weakness of emerging market currencies is nothing new, and it didn't start with taper talk. There is no unifying story that explains what is happening here. Argentina's peso has been clobbered, but the weakness of Chilean peso and the Brazilian real since mid-2011 has only served to reverse the gains these currencies made against the dollar in the four previous years. Over the course of the past seven years, these currencies have pursued widely diverging paths. The currencies of Russia, Indonesia, India, So. Africa, and Turkey have all moved rather closely in recent years. Not surprisingly, these countries have all had higher inflation than in the U.S. Consider the annual inflation rates for these countries over the past 2-3 years: So. Africa 6%, Russia 7-8%, India 8-9%, Turkey 8%, Indonesia 6-7%. Argentina's annual inflation rate has been at least 25%, so its not surprising that the Argentine peso has been the weakest of the emerging market currencies. If inflation in country A is much higher than inflation in country B, then it is reasonable to expect that the currency of country A will decline relative to the currency of country B. It's therefore not surprising that Chile's inflation rate has been only marginally higher than the U.S. (2-3% since 2011, vs. 2% in the U.S.), and the Chilean peso has been the strongest of the emerging market group. It's a mistake to pin the problems of these countries and their currencies on the Fed, and it's a mistake to lump them all together. 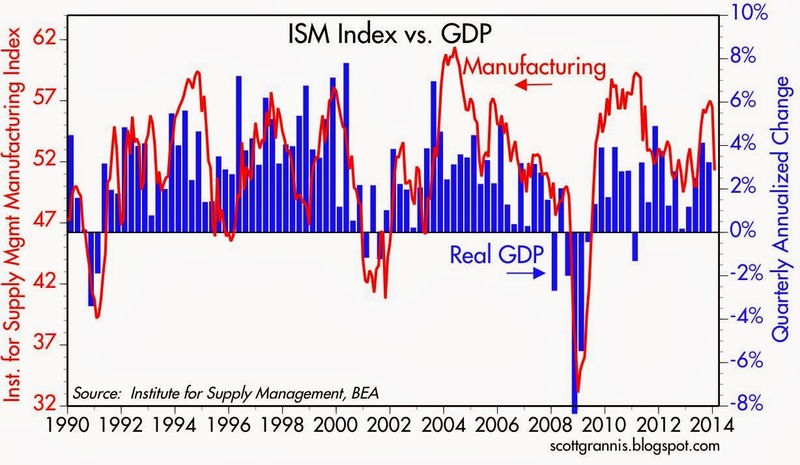 Even if we take the ISM report at face value, the chart above suggests that it is still consistent with overall GDP growth of 2-3%, which is what we've had for the past four years or so. 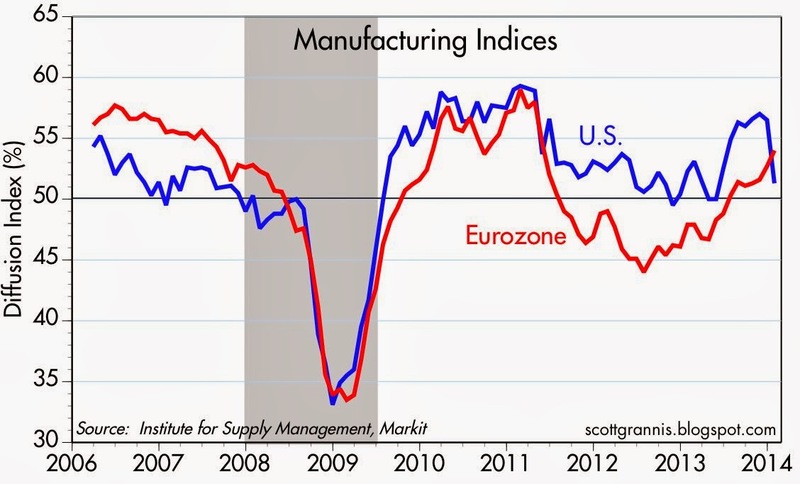 However disappointing the ISM reading, it doesn't imply a change in the status quo. The stronger numbers that came out late last year probably got some people excited about an acceleration of growth, but that might have been too much to hope for given the ongoing headwinds of high marginal tax rate and regulatory burdens. 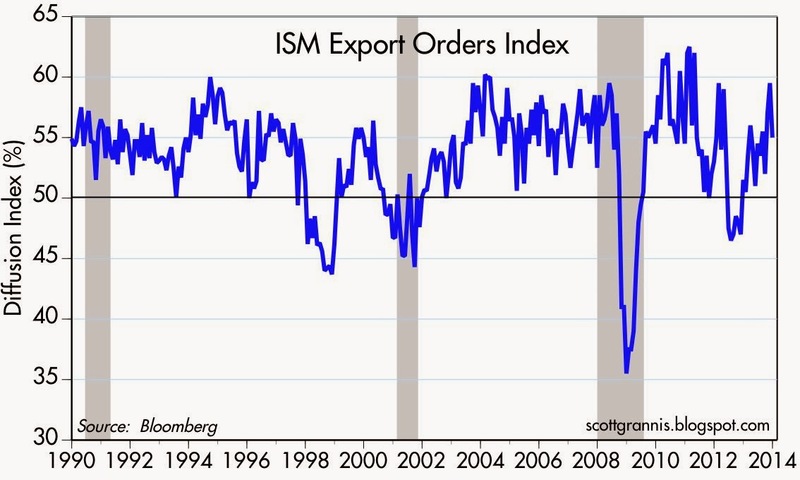 The export orders index also dropped sharply, but it does that frequently, and it is still at a reasonably strong level. No reason to think that conditions in the rest of the world have deteriorated to any alarming degree all of a sudden. In fact, the news from the Eurozone continues to be upbeat, with the Eurozone manufacturing survey posting almost two years of gains. China is the one everyone is really worried about, but the China manufacturing index has been trading at slightly over 50 for the past two years, suggesting that there is no meaningful deterioration there. 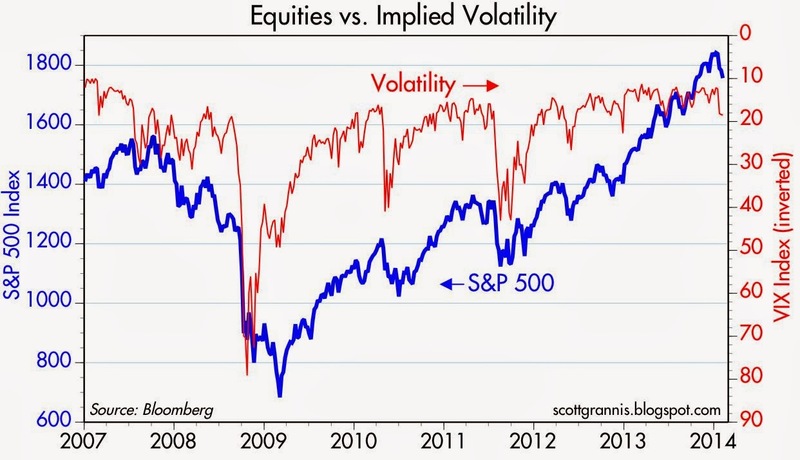 The chart above is designed to show that nearly every selloff/correction since 2008 has been accompanied by a rise in the Vix index, which in turn is a proxy for the market's level of fear, uncertainty, and doubt. 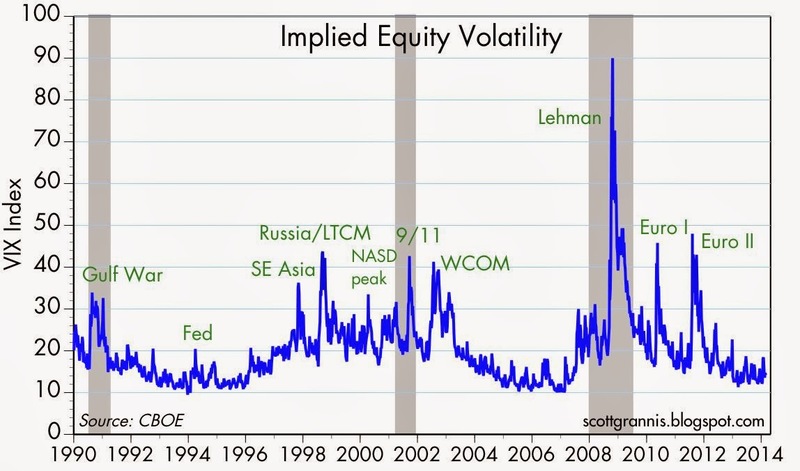 But importantly, the really big selloffs were accompanied by huge increases in the Vix index: these were times when markets worried about major dislocations such as the potential collapse of the global financial system (2008), or the collapse/default of major Eurozone economies (2010 and 2011). Since 2012, the Vix index has itself become much less volatile. There's been much less uncertainty, much less to worry about in recent years, and this has contributed to the rising prices of risk assets. In the current correction we've only seen the Vix briefly reach into the low 20s, which is what happened last October, when the market slumped some 5%. As of yesterday's closing low, the S&P 500 had dropped 5.7% from its recent high, and as I write this, the Vix is back down to 18.6 and the market is up almost 1%. So far, this is a garden variety correction. Unless there is something really terrible brewing out there (and I note that swap spreads remain very low nearly everywhere, suggesting there is not), I doubt we are on the cusp of a major market reversal. The troubles affecting the emerging markets are largely of their own making (e.g., years of rapid money supply growth, falling currencies, anti-growth fiscal policies, and a general lack of confidence), and in any event there's little reason to think that the emerging markets tail will wag the global dog. Besides, the ingredients of a serious threat to emerging market economies—high real interest rates in the U.S., a strong and rising dollar, and falling commodity prices—are simply absent at this time.